→ StarWars.com has added/updated some databank entries for The Last Jedi. They’re pretty vague! → A nice lengthy Mark Hamill interview is short on The Last Jedi details, but still pretty fun. At much less length, Domhnall Gleeson. → Behind the scenes footage of The Last Jedi will be among the Disney movies featured in one of those before-the-showing reels. A third Star Wars web show is on the way. Under the new Disney Digital Network, StarWars.com will launch ‘Science and Star Wars,’ a collaboration with ILM hosted by Anthony Carboni. Unlike The Star Wars Show and Rebels Recon, this will be a Facebook exclusive. She’s a bit of a wounded animal when you meet her. There were moments when she’s been blown over, she’s scrambling to get up, and she falls. It’s important that she’s not perfect. She describes Jyn to a blend of Luke Skywalker and Han Solo. She also addresses being a feminist, how Jyn isn’t sexualized, and being paid fairly. → The Rogue One cast will be live (on Twitter?) this Friday. → The StarWars.com Databank has some new Rogue One entries, including Bistan, Moroff, Pao, Edrio Two Tubes, and the TIE Striker. In the latest Star Wars Show, it’s been 20 years of StarWars.com. The site itself has a nice oral history, and on the show there’s a chat with Pablo Hidalgo and Lynne Hale. Fun fact: One of the reasons I started this blog was that a lot of Jaders weren’t keeping up with news on the official site. Also, I was a message board moderator there, for some reason. Never again. But seriously, the official site has been a boon to fans, and I’m very happy that it’s continued to grow and change. Happy 20 years, StarWars.com! Alan Tudyk drops some details on his Rogue One character, the droid K-2SO, over at Entertainment Weekly. He adresses Kaytoo’s past as an Imperial security droid, his accent, and his relationship with Diego Luna’s Cassian Andor, and even describes a scene – or part of one, anyway. EW this week has also covered the planet Jedha and spoke to Riz Ahmed about his character Bodhi Rook. → Speaking of Bodhi, Birth Movie Death’s Siddhant Adlakha looks at what the character and the casting bode for the new era of Star Wars being more inclusive. → A whole bunch of Rogue One stuff has shown up in the StarWars.com Databank. Most noteably, we learn that Jedha is “small desert moon frosted by a permanent winter” and “home to one of the first civilizations to explore the nature of the Force.” We also learn what Orson Krennic is director of, more about the death troopers and where Saw Gerrera has been hanging out. Also up: Jyn Erso, Cassian Andor, Chirrut Imwe, Baze Malbus, Bodhi Rook, K-2SO, shoretroopers, AT-ACTs and Scarif. → Donnie Yen talks to Extra about one reason why the Empire may be so interested in Jedha. → Rogue One has an official synopsis. It’s nothing we don’t know already. Hosted by StarWars.com’s Andi Gutierrez and Peter Townley, ‘The Star Wars Show’ will appear every Wednesday at 12:00 p.m. PT. (3:00 p.m. ET.) It will cover a wide variety of Star Wars news and stories from across the franchise. In the inaugural episode, they talk to World of Warcraft director Duncan Jones, recap Star Wars Day, and show some extra scenes from Maz’s castle in The Force Awakens. Hello once again! 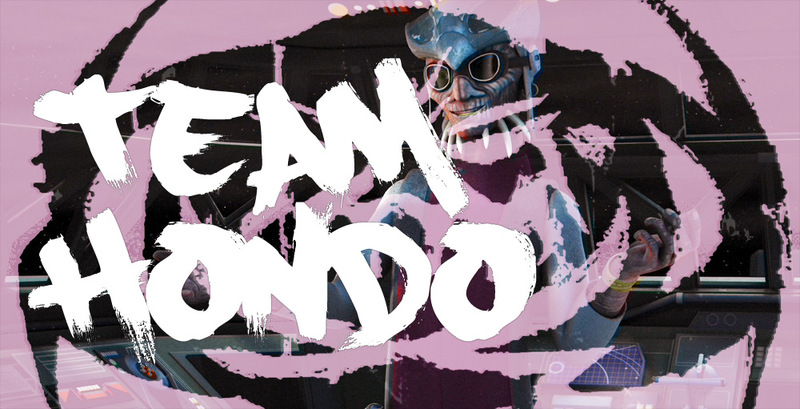 Hondo Ohnaka, Scourge of the Spacelanes, is back, and I have had a most profitable weekend. But you are not here to listen to me talk about it. You want me to give you orders for starwars.com’s ‘This Is Madness’ character tournament instead. But I will tell you about my weekend anyway, before I give you the picks. Monday: Light Side: Yoda against Ahsoka Tano. As you know, I am not a fan of most Jedi. And Yoda seems to be most Jedi. And he beat Finn. Ahsoka, on the other hand, she was smart enough to leave the Jedi Order. Plus, I consider her a friend. Or at least an ally I can trust. She did say she didn’t want to hurt me. So pick Ahsoka Tano! On the dark side, we have Kylo Ren vs. Count Dooku. I did not want either of them to advance, yet here they are. Kylo Ren appears not to have any of the social graces that Dooku has. Even though he became my enemy after I captured him – it was only business, I tell you, Dooku, at least was polite. Perhaps less welcome once his Grievous and droid armies had captured my headquarters, but we lived to take it back, or at least wait until they left. Kylo Ren – he’s an angry fellow. Not good for business. Ha! Not good to deal with, at all! So Dooku. Maybe if I help him win, he’ll end his grudge against me. Tuesday: Let’s talk about the dark side first: Boba Fett against Grievous. I do not like General Grievous. I think you know why. Boba Fett, though, he was a pretty good kid, for a bounty hunter. And I hear he became a good bounty hunter when he grew up. But then he fell into the Sarlacc Pit. But still better than that cyborg claw guy. So Boba Fett. Light side: pick between Rey and Leia. Rey is a scavenger who survived in a hot wasteland alone, can fly anything, and might be a Jedi. Leia is a princess who survived her home planet blowing up, can lead anything, and might be a Jedi. This is a tough call. Both of them are worthy light side heroes. But I think I will pick Rey. I hear she’s really popular at the conventions these days. Rey, even though she beat my friend Ezra.